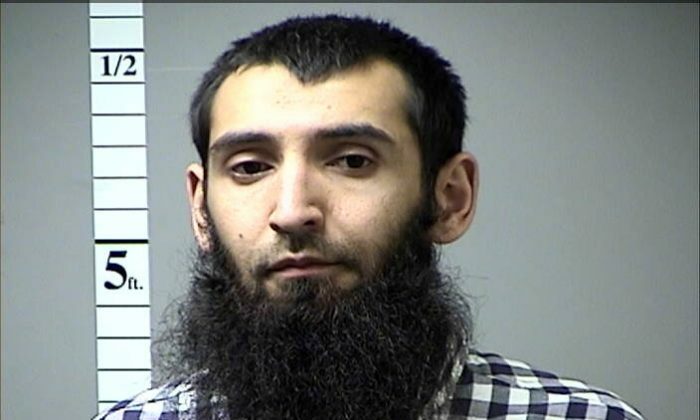 NEW YORK—An Uzbek immigrant accused of plowing a truck down a New York City bike path, killing eight people, told investigators he had been inspired by watching ISIS terrorist group’s videos and began planning the attack a year ago, according to a criminal complaint filed against him on Wednesday. Sayfullo Saipov, 29, who was hospitalized after he was shot by a police officer and arrested, confessed to authorities that he made a trial run with a rental truck on Oct. 22 to practice turning the vehicle and “stated that he felt good about what he had done” after the attack, the complaint said. In the course of that interview, the complaint said, Saipov told investigators he chose Halloween for the attack because he believed more people would be on the streets and said he had originally planned to strike the Brooklyn Bridge as well as the bike path on the western edge of lower Manhattan. The complaint said Saipov had requested permission to display the flag of the ISIS in his hospital room. It said he was particularly motivated by seeing a video in which Abu Bakr al-Baghdadi, who led the campaign by ISIS—to seize territory for a self-proclaimed caliphate within Iraq and Syria, exhorted Muslims in the United States and elsewhere to support the group’s cause. Separately on Wednesday, the Federal Bureau of Investigation said it had located another Uzbek man, Mukhammadzoir Kadirov, 32, wanted for questioning as a person of interest in the attack. The FBI earlier had issued a wanted posted for Kadirov. The assistant director in charge of the FBI’s New York field office, William Sweeney Jr., declined at a news conference to give any details on Kadirov or where he was found. Saipov was charged with one count of providing material support and resources to a foreign terrorist organization, specifically ISIS, and one count of violence and destruction of motor vehicles causing the deaths of eight people. Tuesday’s assault was the deadliest in New York City since Sept. 11, 2001, when suicide hijackers crashed two jetliners into the World Trade Center, killing more than 2,600 people. Of those killed on Tuesday, five were Argentine tourists, who were among a group of friends visiting New York to celebrate the 30th anniversary of their high school graduation, one was a Belgian citizen, one was a New York resident and one lived in New Jersey. Saipov, seated in a wheelchair, appeared for a brief hearing in Manhattan federal court Wednesday evening before Magistrate Judge Barbara Moses. A Russian interpreter translated for Saipov. Moses appointed public defense attorney David Patton to represent Saipov.